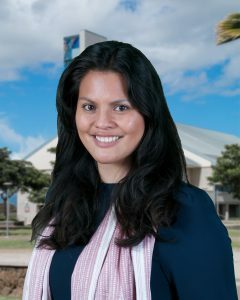 Elise Leimomi Dela Cruz-Talbert, Sustainable Community Food Systems instructor and PhD candidate in Epidemiology at the University of Hawaiʻi at Mānoa, is one of the authors of an article published by JAMA Network Open, an international, peer-reviewed, open access, general medical journal. Dela Cruz-Talbert helped with the acquisition and analysis of the data used for the article, statistical analysis, and drafting of the manuscript for “Effect of the Children’s Healthy Living Program on Young Child Overweight, Obesity, and Acanthosis Nigricans in the US-Affiliated Pacific Region: A Randomized Clinical Trial.” University of Hawaiʻi at Mānoa’s Dr. Rachel Novotny was the lead author and principal investigator of the study. The article came out of work done by the Children’s Healthy Living Program for Remote Underserved Minority Populations in the Pacific Region, where Dela Cruz-Talbert worked prior to coming to UH West Oʻahu. Scholars from the University of Hawaiʻi at Mānoa, and others from the University of Guam, Northern Marianas College, University of Alaska Fairbanks, American Samoa Community College and the University of Hawaiʻi Cancer Center contributed to the article. The Children’s Healthy Living Program intervention focused on reducing childhood obesity, overweight, and acanthosis nigricans (a skin condition associated with developing type 2 diabetes) across the U.S. Affiliated Pacific using a multi-jurisdictional, multi-level, multi-component community intervention model. The article notes that Pacific Islanders have among the highest rates of obesity and type 2 diabetes in the world and that targeting children is critical to prevent young child overweight and obesity and to improve health. The study included 8,371 children in 27 communities in Alaska, American Samoa, the Commonwealth of the Northern Mariana Islands, Guam and Hawaiʻi. The randomized clinical trial examined whether 19 activities (addressing policy, environment, messaging, training and behaviors) were worthwhile interventions and found the effort reduced the prevalence of young child overweight and obesity and acanthosis nigricans. The Children’s Healthy Living Program decreased overweight and obesity prevalence by almost 4 percent among 2 to 4-year-old children in this study. The study demonstrated that comprehensive, effective, and sustainable interventions which incorporate community leadership are needed to improve child health in the US-Affiliated Pacific region. Tagged applied science, Children’s Healthy Living Program, Elise Leimomi Dela Cruz-Talbert, sustainable community food systems, The University of Hawaiʻi-West Oʻahu, University of Hawaii at Manoa, www. Bookmark the permalink.